Marketing today is both amazing and terrible. On one hand, innovative technology and rich data sources are available to savvy, forward-thinking marketers. On the other hand, fragmentation can make collecting and activating the data across myriad channels seem like an onerous, if not impossible task. Add to that the challenges of ensuring your customer data is complete and accurate across screens, devices, inboxes, and mailboxes. And yet, getting a true view of your customers is essential to giving them the relevant, personalized, and engaging experience you hope to deliver. 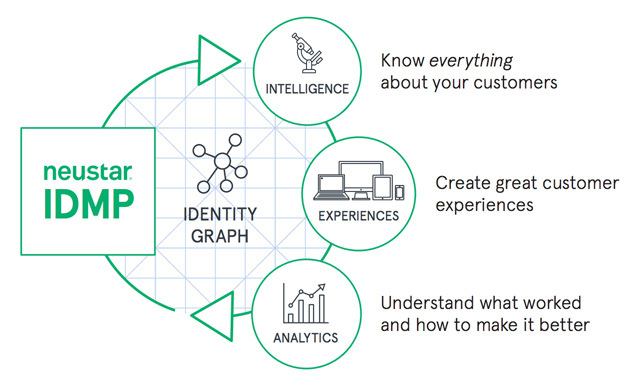 The Neustar Identity Data Management Platform (IDMP) — named a Leader in the Forrester Wave, Data Management Platforms, Q2 2017 — gives you that true, identity-based view required to effectively activate your marketing. And by “identity,” we mean a single source of robust, person-based data that has been securely pseudonymized to protect consumer privacy. Not just browser cookies, and definitely not mountains of outdated personal details. A cumulative legacy of customer interactions connecting past and present, known and unknown linkages, to build a singular view of your customer. A persistent record of identity that will improve the customer experience through relevance, personalization, and thoughtfulness across all channels. Know who your best customers are and why. Build the right targeting strategy for your business with a complete view to amplify reach, scale, and accuracy. The Neustar IDMP doesn’t simply interpret the past, it provides the measurement and attribution tools to help you understand what is working, what isn’t, and what to do next. With access to granular event level data that connects physical and digital signals, the Neustar IDMP provides flexible - rich intelligence to enable smarter marketing and greater control. Neustar has adopted “Privacy by Design” principles, taking personal privacy into consideration throughout the process of designing, building, and delivering information products and services. Streamlined data ingestion, inventory and processing systems and technologies that automate the application of our data governance policies and rules to ensure security and privacy to meet GDPR requirements. Neustar has adopted industry best practices including, ISO 27001 compliant data security policies and procedures. Neustar is a member of the Network Advertising Initiative (“NAI”) and the Digital Advertising Alliance (“DAA”) and adheres to each organization’s Codes and Principles. Our IDMP adheres to the European Interactive Digital Advertising Alliance’s (“EDAA”) principles described at: www.youronlinechoices.eu. Neustar and its subsidiaries (participate in and have certified their compliance with the EU-U.S. Privacy Shield Framework and the Swiss-U.S. Privacy Shield Framework. Neustar has received TRUSTe’s Privacy Seal signifying that this privacy statement and our online data management practices have been reviewed for compliance with the TRUSTe program. Get onboarding services, multi-touch attribution, marketing mix modeling and optimization all within a single platform, unlike other DMPs. Maximize personalization and relevancy using what you know about your customers to build smarter segmentation. Integrate offline identity into the digital ID space for real people-based attribution. Take ownership of your intelligence with direct access to granular event level data. Consultative support teams that connect global strategy to local execution.